Drones are contributing to humanity’s endeavours in a number of ways. Some of these include the registering of remote areas in the Mongolian desert, the monitoring of forest fires in California and the delivery of medical supplies in Rwanda. Initially developed for use by the military, today this technology is utilised across a wide range of areas, and it currently represents a great opportunity for activities relating to the environment. This is the case for one project in particular: “Exploring drone use to support conservation and restoration of forests in the mosaic of protected areas in the Sertão Veredas-Peruaçu region. As a result of this project, drones will soon be seen flying over the Cerrado, the planet’s most biodiverse savannah that has already lost 50% of its original area. And what will be their mission? To conserve the Sertão Veredas-Peruaçu Mosaic, a region composed of 25 protected areas located in the north and northwest of the Brazilian state of Minas Gerais and part of the southwest of Bahia. The project is being financed by the WWF Network’s Forest Innovation Fund, which is seeking to explore the potential for low-cost drones to be used in the conservation, protection and management of forests. The project is being carried out in in partnership with WWF-Brazil, the Kashmir World Foundation (KwF) for technology and robotics and the Mosaic of Protected Areas in the Sertão Veredas-Peruaçu. It also receives support from the Cavernas do Peruaçu National Park, administered by the Chico Mendes Institute for Biodiversity Conservation (ICMBio), and the Peruaçu Valley Family Farmers and Extractivists Cooperative (COOPERUAÇU). According to Felipe Spina, a biologist and conservation analyst for WWF-Brazil, “One of WWF-Brazil’s objectives is to introduce new technology into conservation activities. To ensure restoration and conservation efforts are successful, we need to guarantee that local populations play a significant part and combine their traditional knowledge with science and technology. This will pave the way toward consistent conservation practices and the development of innovative public policy. In addition, we obviously need to make sure this knowledge is actually accessible." To achieve its proposal of combining local knowledge and technology, the project is offering a free workshop at the Cavernas do Peruaçu National Park in the state of Minas Gerais from February 4 to February 9. The Fly for Conservation workshop will train up approximately 35 participants in the assembly and operation of unmanned aerial vehicles, popularly known as drones. Spina explains that the project is investigating the use of small low-cost drones using open-source software to assist in the management of forests and the restoration and monitoring of the region’s protected agroecological areas. “We are working on training members of the COOPERUAÇU Agroecological Cooperative, which was founded by sustainable fruit pickers in the Cerrado, as well as local actors involved in conservation, such as managers of protected areas, park rangers, forest fire brigades, NGOs, universities and local communities. We want to empower them with this new technology to enable them to conserve and sustainably manage the natural resources of this important region," he explains. This was the first experience involving drones for Raoni Japiassu Merisse, ICMBio environmental analyst for the Nascentes do Rio Vermelho protected area in Mambaí, in the state of Goiás. “Thanks to the pace that the content is rolled out and the clear instructions from the instructors, I’m not having any difficulty familiarizing myself with this new tool,” he said when asked about the workshops. Armed with this new tool, Merisse described his plans for the future. 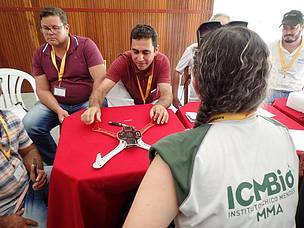 “At the ICMBIO in Mambaí, we want to use drones to map areas destroyed by fire and monitor the damage caused. Like any other protected area in the Cerrado region, we have problems with forest fires. However, we are now looking into the various management activities in our protected areas that could really benefit from the use of drones, including the identification of camps set up by hunters and fishermen. This will enable us to improve surveillance efficiency and safety,” he explained. Hebert Canela, professor of tourism at the Department of Interdisciplinary Humanities, at the Federal University of the Jequitinhonha and Mucuri Valleys, explained that the workshop had boosted activities in the Sertão Veredas-Peruaçu Mosaic and strengthened the integrated management and governance of this incredible territory. “The powerful connection between travel and new technology, developed with responsibility, enables the transformations that can bring about a potential new world. In tourism, this upholds the principals set out in the Global Code of Ethics for Tourism, values natural and cultural heritage and restores the concept of intelligent destinations,” he said. Canela emphasised that this educational action promotes interculturality and encourages the exchange of knowledge to create public policy. The Sertão Veredas-Peruaçu Mosaic spans an area covering the north of the Brazilian state of Minas Gerais and the southwest of Bahia. Originally covering 1.8 million hectares, it was recently expanded to cover over 3 million hectares and comprise a total of 25 protected areas. The mosaic, which is located inside the Gerais region immortalised by Brazilian writer Guimarães Rosa, combines environmental diversity – being home to many fauna and flora species endemic to the Cerrado – and the cultural wealth of its traditional people. However, it has also suffered from conversion of natural vegetation, forest fires and devastation. According to Brazil’s National System of Protected Areas, the integration of protected areas and other conservation sites to form mosaics is instrumental in the territorial management and planning used to conserve biodiversity in these areas. The Cerrado is one of the planet’s oldest biomes containing a rich variety of species. Its flora, fauna and culture make this biome one of the world’s most important natural regions that must be preserved for future generations. The Cerrado is located in the heart of Brazil, spans three South American countries and connects four of the five biomes found in Brazil. The region is home to over 5,000 native Brazilian species, such as the maned wolf, the giant anteater and the jaguar. In addition, it is the source of the water running into the country’s large reservoirs and water basins, and for this reason is often referred to as the “Birthplace of the Waters”. The Cerrado is under threat as a result of man’s activities, however, and this particular part of our natural heritage needs to be seen from another perspective. WWF-Brazil has been active in the Sertão Veredas-Peruaçu Mosaic since 2010 through its Cerrado Pantanal Program, which has been developing its Sertões Project in the region. During the first phase of the project (2010-2014), it mainly focused on the promotion of best practices for agricultural production, the implementation and integrated management of protected areas, campaigns to encourage people to save the Cerrado and territorial planning to enable systematic planning for the conservation of this biome. The second phase (2014-2019) involves the expansion of these activities to include the reinforcement of support for sustainable fruit picking in the Cerrado.